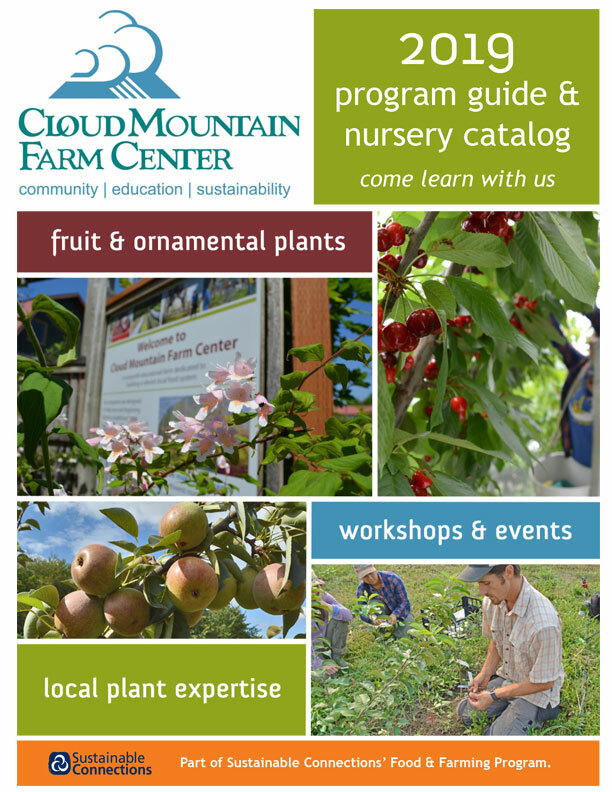 People have starting asking us about when to spray for apple maggot. 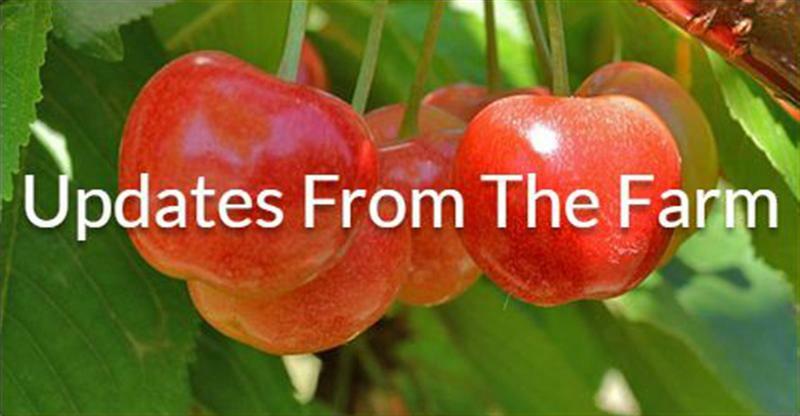 This is a complex pest to control in orchards and home gardens, so it is a good idea to understand its life cycle. Apple maggot, Rhagoletis pomonella, is a small sawfly that lays its eggs on developing fruit, most commonly apples, but also occasionally on pears and quince. The larvae eat their way through the flesh of the fruit as it ripens, often causing it to rot on the tree. (This is different than the damage caused by codling moth, which tunnels straight for the core, leaving much of the fruit still usable). The fruit infested with apple maggot will then drop to the orchard floor, where the larvae will leave the fruit to pupate in the ground. Apple maggot can be a challenge to control in the orchard. One good method for the homeowner who only has a few trees is to apply maggot barriers. These nylon barriers should be on your fruit now, hiding it from the flies when they emerge and start looking for laying sites. Another preventative method that works in larger orchards is to spray with a product called Surround. This is finely ground kaolin clay, and it also works to “hide” the trees from the pest. It must be applied before the flies start laying eggs, and it will turn your trees gray to white. It is not an easy product to find, but it can be ordered online. It must be reapplied after rain. You can also use insecticides such as spinosad to control the pest. You need to time the sprays carefully. The flies begin emerging from the soil in early summer. Like for codling moth, scientist have developed models that can predict the timing of the emerging flies. Here at the Center, we have found our first fly. 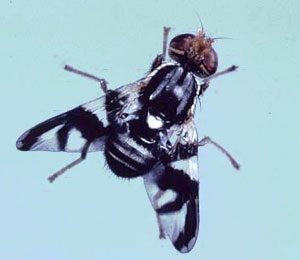 Models suggest that the adult flies emerge and take about 10 days or 300 heat units to start laying eggs.Right now, the models are predicting the first fly emergence for the cooler Bellingham area in early July (none found yet at my orchard just north of Bellingham). The best way to monitor for the flies is to put up sticky traps and check them frequently for the flies. That is how we confirmed the first emergence here at CMFC. 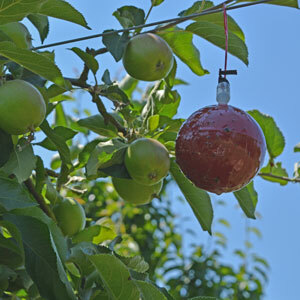 You can buy red sticky traps that look like apples, or use yellow cards with an attractant. Check them frequently, and spray when adult flies are present. If you have had very light apple maggot pressure in the past, you can put up three traps per tree, and try to trap most or all of the flies.